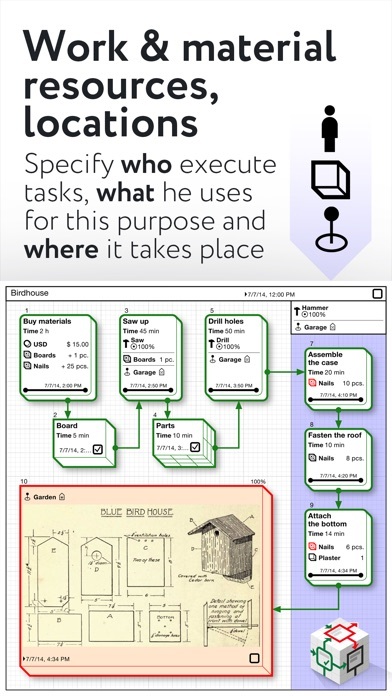 Truly remarkable process maker app. I never knew this app was so easy and powerful, until I a came across a YouTube video tutorial. It’s a must for business analysts , project managers or anyone who wants to define process and workflow. I wish the developer add more features like collaboration and notification users to other users. Also if the developer uploads some guide of short YouTube videos tutorials to new users. Good luck trying to figure out how to get started let along getting to use it. What I'd like to know is when are you coming out with the version for the Mac and linking the iPad version to it for data transfer, etc.? I do highly recommend reading the book on TOC and then diving in with a critical project. It's more than a 50/50 chance that you'll get to rely on this product. One area of improvement would be to put in some more editing tools say for cut and paste of multiple objects instead of the one-at-a-time process that exists now. Otherwise, so far so great! Yesterday I heard about inShort for the first time, and I purchased the iPhone version. Today I purchased the iPad version. I will likely buy the Mac version before the end of the week. Why is this program certainly one of the five best software tools I have ever seen or used in my 30+ year career in IT? Because it teaches you how to learn. One of the biggest deficits in any educational program, tool, or system is the lack of an organically embedded encouragement layer that prods and rewards the student/user for improving their learning skills. Yes, many people can set about learning many things, and they do, but learning how to learn better improves your abilities (and your thinking process) across the board. Outlining, project management, and analytical tools come and go. Entire software companies come and go. But a book, painting, movie, or experience that deeply changes your life is golden. And a learning experience that deeply changes your life is worth an entire bank in terms of personal value. Looking at the big picture, this "small," lone program is possibly the best Swiss Army Knife on the entire apps store. For that reason alone, it is the best bargain available. But since learning and using it will hone your mind like nothing before, if you value your impact on the world and your ability to contribute to the evolution of the human species, you owe it to yourself—and all of us—to get this program, use it a bit, and improve your mind and analytical process faster and better than just about any program, course, or book available. Once you get through the user guide - either the PDF document from the developer website or the excellent version in the app - you'll be equipped to use InShort effectively. The developer has done a fantastic job of creating a robust tool that allows for complexity to be reduced as much as possible. DO NOT think you're gonna jump into this app without a little time investment in learning how to use it well. But once you've educated yourself a little bit, you'll be a powerful wielder of a tremendous tool. I noticed another review comparing this to Microsoft Project. If all you do is projects...and all you care about is milestones, and such - then of course, there are better apps for that. If you want to model processes and a variety of other capabilities this app supports, then get this app. Other apps in the store and software like Microsoft Project, come up woefully short - they weren't designed for that. This app is great at what it was designed to do - and that should be the starting point of all reviews - how well does it do what it was designed to do! Easy to use, it takes a little bit of time to master but is worth your time and money. App no longer starts up, just shows an error dialog message. I have owned this app for years and I can’t use it. Not intuitive enough and so far from user friendly. If I have to study, research and take forever to learn a program, unfortunately that can not be the program I use or share with my team. I was so excited when this was first released but I could never use it. A real shame. iN SHORT: Business people do not have enough time in a day, month, year, to figure this program out. For fans of process, logistics, and detailed diagrams and process maps, this app is can be an amazing tool. The feature set is astounding for an iPad app. But be prepared for a bit of a learning curve. The built in walk-through is time well spent. Do not update. The current update 5.3.1, crashes! I do have many projects depending on this app but I am stuck in this wasting time and money situation. Frankly speaking, I think after recovering this issue I should think wisely next time by not depending on a specific app doing my important bushinesses. As an alternative, any apps that are sharing data among each others are smart choices to save time and money during disasters. Sorry, "Technologies should be adapted to us and not vice-versa!" Wow! So much power in such a small space! I got this app for my phone and quickly got started working with it. I found it intuitive because I've used other project management tools such as MS Project. However, for those who are newbies it might take a little bit of patience and determination to go through the User's Guide. It is very worth your while. So much more flexible and fun than other project management apps. My next step is to get it on my laptop so I can integrate it with all my work apps. The beauty of Microsoft Project is that it is intuitive to begin to use, and the user can then advance to using a greater deal of details and planning tools hidden underneath the veil of its pleasantly deceptive intuitiveness that might at first lead one to think it's too simplistic. This app, however, lacks this species of intuitive beauty, and yet rather seems to have great potential in detailed planning and advanced visualization techniques. Nonetheless, few will likely commit the large amount of time to ploddingly learn the details of a one-off app (only used by a few) in order to first just simply use it to purpose. I'm just entering the world of project planning, and this program has been immensely helpful. I'm shocked at the functionality considering the low cost. Major props to the programmer. Well done! I hope there are plans to make a windows version, being able to use this wonderful tool on both devices would make it perfect. Looks like it's probably a useful app once you figure it out. (I can find zero tutorials on YouTube) they apparently decided to completely reinvent the wheel with how projects are structured. Byzantine. Amazed no ios developer in the galaxy can just provide the functionality Mac Project had in 1983 or MS Project had in 1994. Version just uploaded (current) is crashing my iPad 3 at the first screen. My iPad has 20gigs currently available. This app is a good idea, however it has serious problems and does not perform well. It needs serious bug fixes don't waste your time with it, at best it is at 50% beta. I wish I had my time and money back!!! The app is powerful, beautiful, and useful. Learn it! Use it! I guarantee you it's worth it! This app makes all other flowchart apps look like finger paintings. 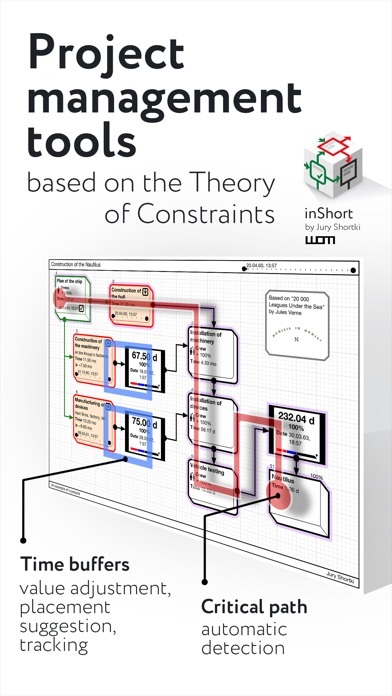 If you've ever needed to manage a highly complex diagram and present it in a simple way to non-technical people, you just hit the jackpot with inShort. Great idea with the potential to be a great program. Program is very buggy and I wasted hours going through the tutorials and entering a project. Program lost all scheduling and doesnt allow for additions or changes. I cant recommend this for anything critical. This is a very good program. But after latest upgrade, App crashes on launch. Reinstalling the App and restarting the iPad does not help. I am working on an iPad 2. Developer please fix. Awesome looking program...wish I could use it! I went through the entire tutorial with no problem, but when making diagrams this version isn't working right for me. I am using an Ipad 2. I have tried to create processes twice, with the program crashing both times, resulting in a loss of work. I don't see reports of problems preceding this version, so hopefully the developers will quickly resolve these issues. A lot of logical GUI and English problems in the menu called "Options": 1. NO !!!! option to export chart to HTML, XML, and CSV --------------------> The advertisement is wrong ! 2. There is an option to export reports ONLY (not charts) to HTML, XML, and CSV 3. Programmer's English language is not appropriate for Apps GUI: For examples: In the "Options" menu, programmer uses words "Mail" & "Send" as synonyms, that is totally wrong technically in iPAD ! The word "Send" in iPAD also means sending to other Apps, not to Mail The same problem programmer has with words "Create a file" and "Make a file"
Nice design, but crashes and you lose your work! Also cannot explicitly save files in the 1, 5, 10 min auto save feature. (To the developers): Don't add any new features, please just fix this problem first! Хорошая программа, которой есть куда развиваться. Мне понравилась программа. Позволяет упростить жизнь, как рабочую, так и обыденную. Не понравились: интерфейс, дизайн, обилие специфических (понятных автору) терминов. First of all, I love how the author is calling it a program, not an app. This is accurate. The software is simplistically, yet powerfully, robust and well thought out... well-implemented and very intuitive. The logic involved in using inShort makes it exciting to plan within my projects. Finally, I have a mobile app that allows me to define, organize and execute complex projects with greater efficiency and quality control. Haven't experienced any crashing, very pleasant and interactive UI... No complaints yet, awesome job! Wishlist as of v4.4.7: - Dropbox integration (with ability to navigate & choose import/export locations). Users with clear communication skills: please write a glossary of terms, user manual and a short you tube video un English showing how to use this. 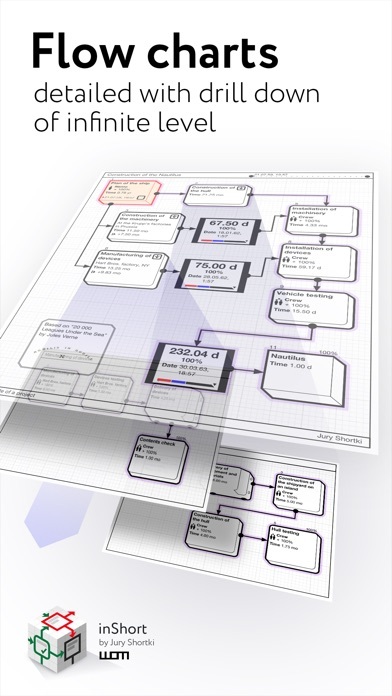 SmartDraw and other Mindmapping software w Gantt chart capabilities are so much easier inShort. inShort seems to have potential value but is still cryptic. The controls are difficult to use, very complex app. Not very intuitive. I like the idea, I just wish it didn't require a week to figure it out. I have been looking for process diagramming apps that let you create a library of everyday processes, and this is the most useful I have found so far. The learning curve may be a bit steep, and the interface could be more intuitive at times, but overall it is a really well done app for specialists who need this sort of thing. It would be better if you could mark tasks done with one touch, if timed steps were more animated (with a display of time remaining and elapsed, for example), and if it could store data in a more useful way so you could actually use it to do things like track service schedules and trip mileage for your car, and then produce a report. I love that you can select text formatting, embed illustrations (pictures, but unfortunately not video) and web links. 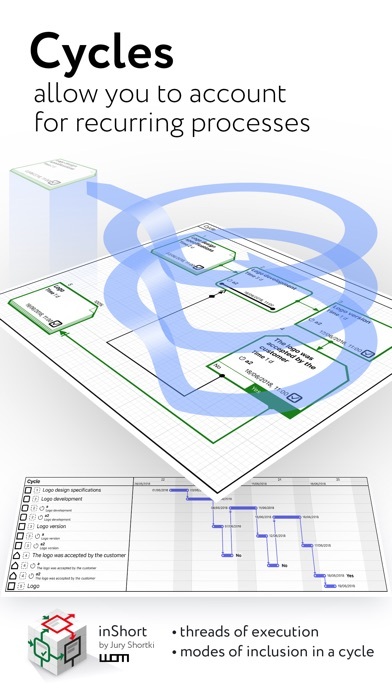 The diagraming interface gets the job done without being too clumsy. The list view is pretty good, but having the status of items all the way on the right makes it look cluttered and hard to read. With a little more work, this could become a very useful tool for everyday use. I have inshort on my iPad and use it for construction management. I manage residential house construction for my investment business. I am used to Gantt charts but now have moved over to flow charts and find it much easier. The learning curve has been fairly steep but I have found that the time and work have paid off. Love the program and am really looking forward to iCloud integration. I will only have to carry my iphone. I plan on putting it on my Mac Minni. I am also considering tr.en.d. I am hoping it will make me more aware of how I spend and allocate money. I feel like I could take over the world with this app. It's unbelievably robust, yet simple. I bought it to make flow charts and map out my startup/client business, but it could be useful for anybody dealing with ideas/processes/resources. Extremely well done. I hope it doesn't change much because it really doesn't need to. Will look good and do its job forever, as is. Did I Just Throw Away $7 ??? The drawing of hierarchical diagrams lacked a proper tool until now. No longer! I use inShort to prototype projects, as well as to design large scale brain networks. 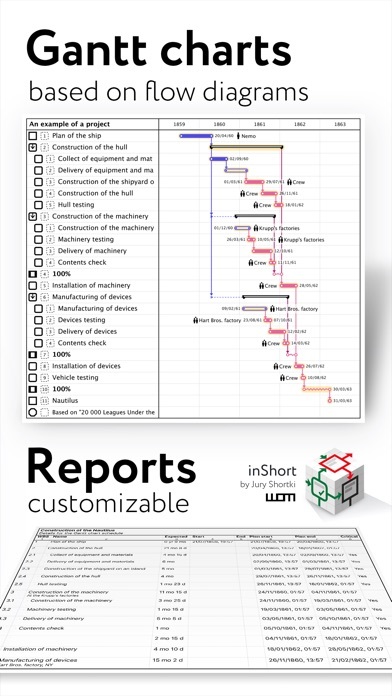 InShort has the potential to be the best gantt and pert app out there, but it is so much more. Here's hoping for collaborative planning to pop in soon. The graph engine could also use some work. Beware, though. The learning curve is steep (though the tutorial provided is great help). Update** Available on your Mac too! Finally, after waiting for a good while I can use it on my Mac. My life is complete now. In case you're wondering, this is the absolute best app for logically mapping out all your ideas and making them into a solid work frame. As a software engineer I would highly recommend it for anyone who has complex though processes in need of organization. After considerable digging through multiple organization apps. I can easily say that inShort is by far the most logical and organized approach to any complex task you might encounter. We'll worth the extra few bucks. One thing I would of loved for the future is actual 3-Dimentional capability to be able to visualize data in multiple dimensions. Our minds are evolving along with technology and I believe its time to step away from pen and paper and move to the wold of the 3D and beyond. Even went through the instructions, not intuitive whatsoever. Keep it Simple. Steep learning curve, but well worth it. I had been eyeing this app for a while, but was nervous it would...fail to execute. Finally spent the money and got it. I'm really happy I did. I can't tell you how nice it is to have an app that understands not just mapping of tasks but also NESTING. So if my goal is "Get better at baseball" I can create a diagram with "Best baseball player I can be" at the top, then have five branches "Hitting" "Fielding" "Base Running" "Mindset" "Teammate". I can then create charts WITHIN each of those branches. So within hitting I can have a chart of branches that makes up the content of hitting, and within each of those hitting branches I can create individual charts. I can then actually work my way through the tree until I've accomplished everything. Great, great, great, great app. This is the most useful tool I've found for organizing my thoughts and planning activities. This is the future of project management. I hope to see the developers continue adding useful features. I like that the software is as simple or as detailed as you want it to be. It's also easy to use on an iPad. One thing I would suggest however is that some touch events need not require such accurate positioning i.e. It sometimes takes a few tries to hit/touch the elements of diagrams. Overall, best pm software for the iPad and Mac. App crashes when connecting boxes (arrow) between elements. All input is then lost. Seems like a good concept if it worked. One of the worst ui I have ever seen on a phone. Difficult to get it to do what you want takes forever to set anything up. Ui buttons who only sometimes works as expected. As a mechanical engineer gantt charts have always been confusing but this app does help. Using this software is significantly eaiser to use then Microsoft Project, and at $8(USD) it is definitly worth it. I was looking for an alternative to a full graphing app. Something that looks nice and had gantt charting. This app is so much more. I do a fair amount of flow charting and am frequently frustrated by desktop apps that make you do so much work just for the basics and don't do much at all to help you maintain a common style. This app lets you worry about the concepts of your project or plan and it helps take care of the presentation in a very readable and professional way. If you need to do flow charts for a process or need to visualize and plan a timeline for a project, try this app. There's a learning curve, and it may challenge you, but the on-board documentation and tutorials will help get you going. A great app now useless. I'm a long time user and frustrated with update that won't load on my iPad 3 or iPhone 5. The iPhone at least reports "Unable to prepare statement, out of memory. " Similar crash results from attempting to open app on iPad 3 w/ iOS 9.1 after updating app on 11/4/15. Pros: This app allows for the visualization, design, and execution of workflows. It uses a nested structure so that the user or administrator is never overwhelmed and may proceed linearly, knowing where she is in the process of completion. It allows for the integration of human and material workflows synch'd with existing IOS calendars. It is an astounding project management tool. Cons: This app has a significant learning curve. One must understand how it works in order to use it well. The documentation is adequate, but not exhaustive. Count on a week or two of using the app an hour a day to really get the hang of it. The developer is not fluent in English (tho as a European, has a similar syntax), and as a coder/engineer does not necessarily intuit the kind of hand-holding non-technical people might need. Documentation/User experience: The documentation IS adequate, but it requires the adoption of concepts and perspectives common to technical users. This is not soft, furry, and simplistic software; it is powerful, extremely well thought-out, deeply functioned, and precise. Once understood it creates extraordinary execution of task sequences and process monitoring. Read the free pdf manual before buying! I found this to be the most difficult software I have ever had to learn, merely because it requires a reconfiguration of how I think about processes. The interface, once understood IS QUITE GOOD, has no bugs, and excellent functionality. It is effortless and intuitive to use once one understands it. Once mastered, this software could be used to provide the workflows for a major corporation, or manage every detail of a person's life. For this price it is a steal. It is wonderful. You did great job. Thank you! Easy to learn, but it takes time to master. A good gift for new year. This app has allowed me to focus on the tasks in hand and remain focused on the main goal at the same time. I love how I can nest diagrams inside each other and therefore break a huge project into little jobs together with time scales and all manner of other options. I have been using it to help me launch my business and it has saved me so much time it's unreal. Probably the most powerful app you'll ever download if, like me, you need to get REAL results with your time. Do not update - Liked the app; however since they update it locks up both my iPad and iPhone when opening! Has potential, but I don't get it. I cut my losses on the tutorials and I could tell that I wasn't getting anywhere with the software. It's too complex. The tutorial was very roundabout. I say that because it was 70 pages long. That's called beating around the bush. I needed basic knowledge like I don't know, how to delete. Waste of money. Considering it's an iOS app they need to dumb it down for Apple people. It's probably about once a year I use an app that stands out to me so much I just have to write a review about it. This past year, it's definitely inShort. I've been an MBA student and a freelance consultant to small businesses of 1-10 people, I don't have a ton of real world application to a good chunk of features this app provides, but my research covers almost every app you can think of. I'm not sure if I would say the learning curve is steep, I always considered the learning curve of OmniFocus to be pretty steep mostly because I could never quite tailor my tasks around the GTD method. As an entrepreneur, I don't have a problem getting things done or prioritizing the various aspects of my life, my clients, and my businesses. What I've always had a problem with is finding a solution that can grow and adapt with myself, my clients, and my businesses. I've used MindNode for quite some time which is a great tool to easily breakdown and structure your thoughts when your mind moves a million miles a second, but the problem I was always left with is being able to export, convert, or transform those mind maps into a real usable workflow without custom creating my own application to process the exportable formats. This is where inShort comes in. It's either as simple as a task manager, or as complex as a project manager like Basecamp, Asana, Wrike, etc. I've love the concept of Trello, but it always fell short when in several areas, namely the early stages of actually creating and organizing a complex workflow. inShort also covers this area by acting as a database schema. Everything is connected giving you the power to create powerful relationships. The only downside so far is that I wish they had an evaluation version on the desktop for students. Although it's a huge bargain at $40, I don't have the money for it yet. I'll update my review after I purchase the desktop version and mess around with it. My advice to Jury Shortki, offer some sort of trial or evaluation version, maybe offer a limited number of objects for free, and then charge a monthly subscription based on the amount of usage someone is getting out of it. $40 is too cheap for someone that is actually using this app, but it's too expensive for someone that isn't using it or is skeptical of its capabilities. The online tool was a great move, at least now you'll be able to track and gain more insights to how and when people are using your app.